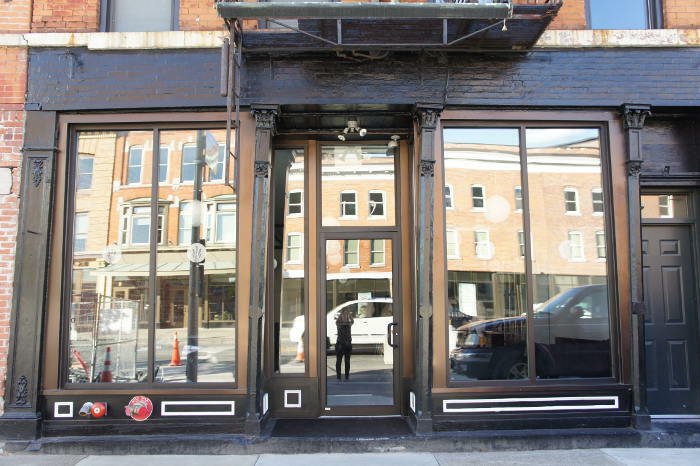 Newly situated in one of Buffalo’s hottest, rapidly developing neighborhoods is Marble + Rye. The owners are the originators of the popular Black Market Food Truck (BMFT) – Mike Dimmer and Christian Willmott. Also well known for their part in the SOB cult short film “King of the Black Market”. The Chef is Dan Borelli formerly sous at The Mansion on Delaware. The Black Market Food Truck features a great Vietnamese Banh Mi, deli sandwiches and an excellent house made Arancini. None of which I found on the compact menu at Marble + Rye. Rightfully so. This is a new gig. If there is a common thread it is that all three mentioned above are dedication to scratch cooking with seasonal, farm fresh ingredients, local when possible. The hot neighborhood is Genesee between Oak and Main. No doubt a product of the growth of the Medical Campus coupled with the restoration of Main Street. 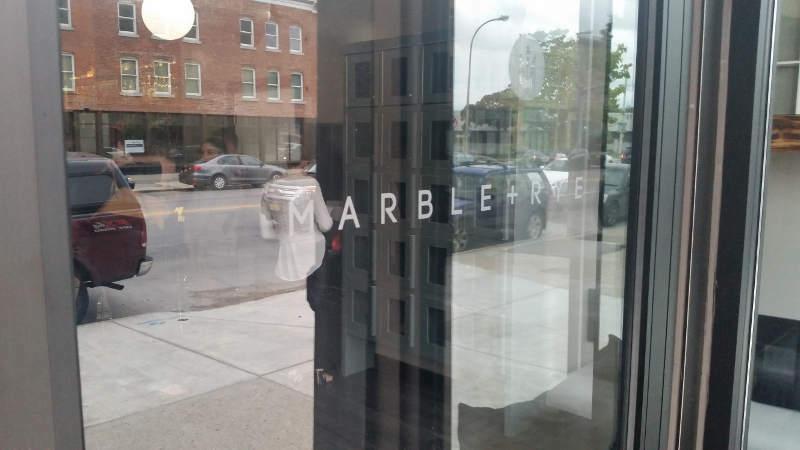 Marble + Rye stands right down the street from Oshun, around the corner from the new Toutant, and Seabar, and on the block with Marco’s Deli, Dog é Style, and the newly spruced Eddie Brady’s. This is quality, “honest” food served in a pleasant, casual atmosphere. 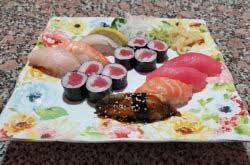 The concise menu covers all the right bases and preparation is unpretentious. The bar talent and offerings alone are enough to bring me back regularly. 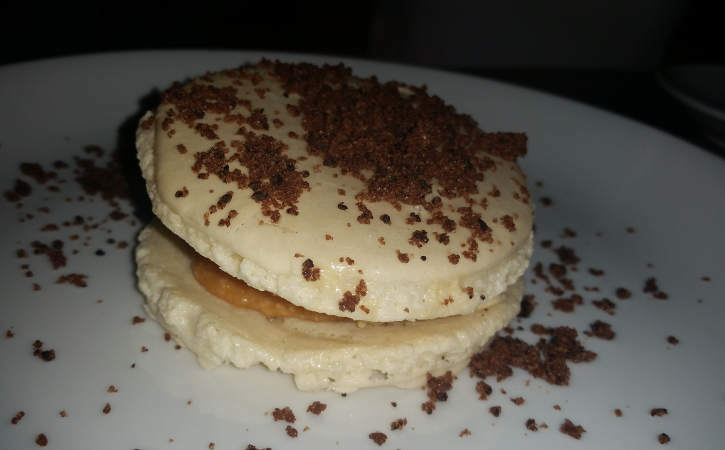 The menu is short but inclusive, with a nice selection of small plates, burgers/fries and four large plates that cover the beef, pasta, chicken and seafood requisites. These guys understand the benefits of focus and simplicity. 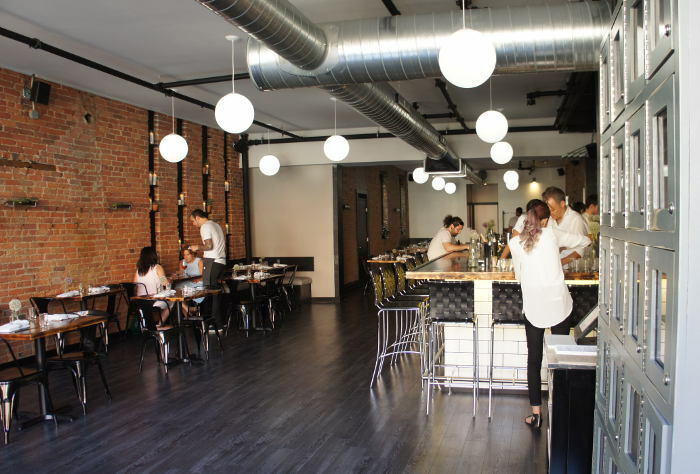 The plan is to change it up seasonally and offer fresh, high quality ingredients, which is best accomplished with a tight menu. We stopped in for our reservation on a weeknight to a full bar and the dinner crowd filling the tables quickly. 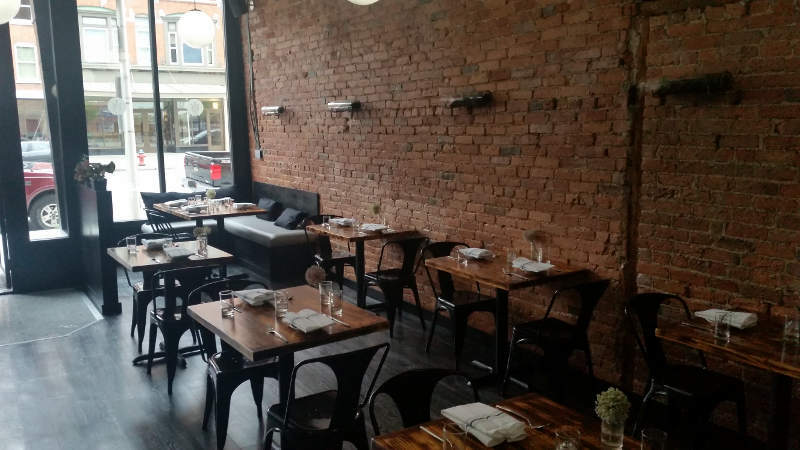 The subtlety elegant front is matched by a comfortable yet sleek interior of brick, robust wood tables and floor. 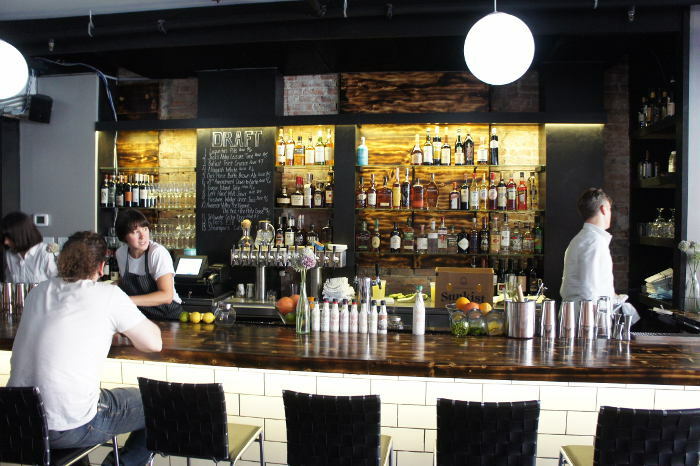 The bar stands in the middle on the right-hand wall with tables surrounding. 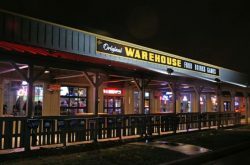 It is one large room that serves both bar and dining patron well. The atmosphere was vibrant on this evening. With an open floor plan and little fabric I could see where the noise could become an issue, but it wasn’t when we visited. We started with a few drinks. The website states the “bar menu has a heavy focus on traditional American rye whiskey because, quite frankly, that’s what we like to drink.” So I went with a Sazerac ($10)-Rye, Simple, Peychaud’s, Angostura, Absinthe Rinse. It was superbly crafted and ignited a few foggy memories of the Big Easy. One of the group enjoyed the Vodka Soda ($8)- Vodka, House Watermelon Soda, Mint. As good as the bar menu is, it does not overshadow an impressive beer list. We sampled the Anderson Valley The Kimmie, The Yink, & The Holy Gose ($6) from Gose, California. An interesting concoction with a sour finish. Before the night was through we also tasted the Ballast Point Grunion ($7)- American Pale Ale, California; Jack’s Abby Leisure Time ($5)-Spiced Wheat Lager, Massachusetts; Jack’s Abby Hoponius Union ($6)- India Pale Lager, Massachusetts; Goose Island Sofie ($6)- Belgian Style Saison, Chicago. Check out the Drink Menu here. 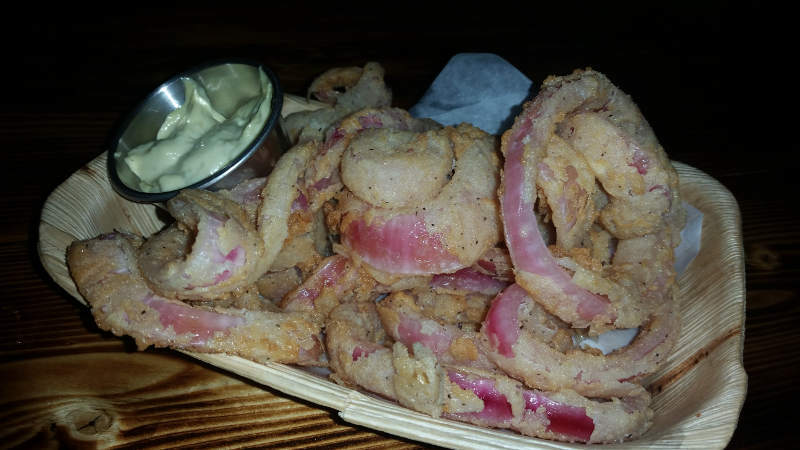 Pickled Onion Rings ($5) with a Green Garlic Aioli for dipping. I could eat these all day long. The pickle and the aioli really elevate this bar snack into an awesome starter. 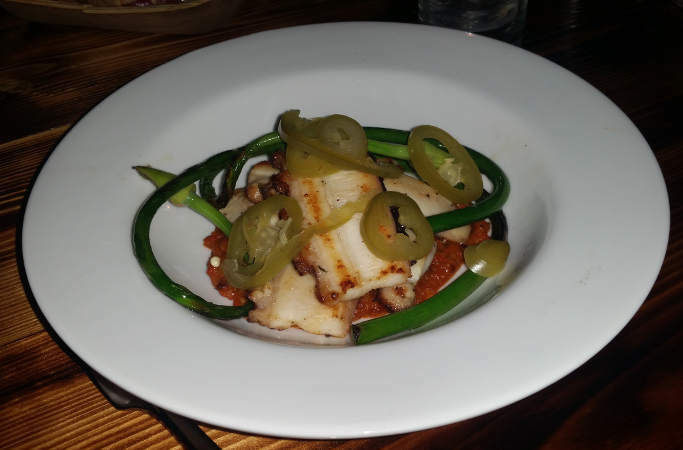 Octopus ($14) – Garlic Scapes, Jalapeno, Romesco. Nice meaty grilled tentacles pair well with this tasty sauce. 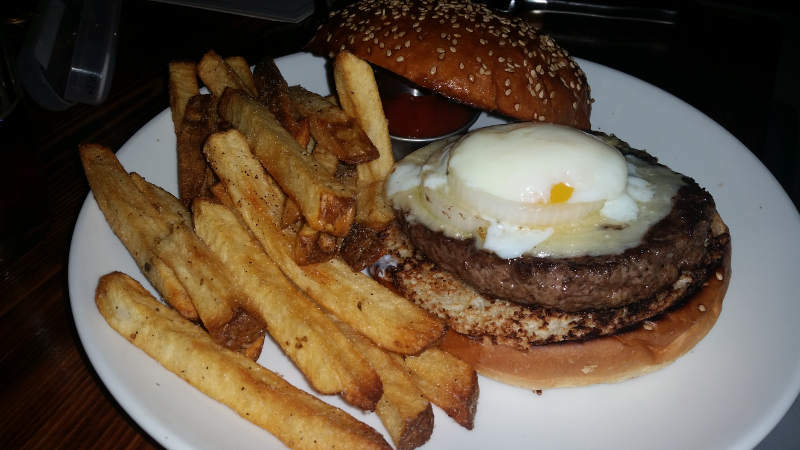 This house-ground burger made of various cuts of beef was perfectly cooked and accompanied by some truly excellent fries. I’m pretty sure the special sauce is the aioli mayo and the bun is homemade. Excellent! Chicken ($24) – half a chicken roasted served with Pork Fat Potato, Oyster Mushrooms. The half chicken is plenty for a mere mortal but if you are really hungry or looking at dinner for two they offer a whole chicken for $45. 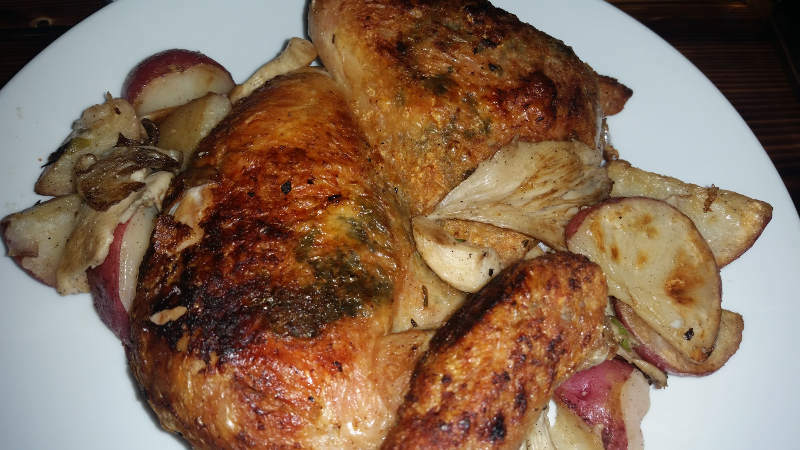 This is a nice simple roast chicken with light seasoning. The Oyster Mushrooms are a nice compliment, the pork fat potatoes good but not special. 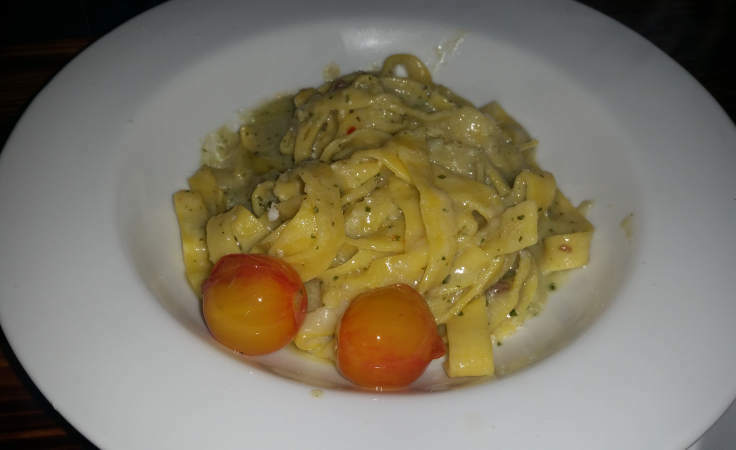 Fresh Pasta ($20) – was a Tagliatelle with a hungarian pepper pesto sauce with tomatoes. The pasta dishes change regularly which is a nice touch and helps keep customers coming back.. This was a tasty and creative sauce on (presumably) a house made noodle. While this is listed in the large plates I’d classify it more in the medium range. Big appetites might want to load up on the apps or look to the other offerings. 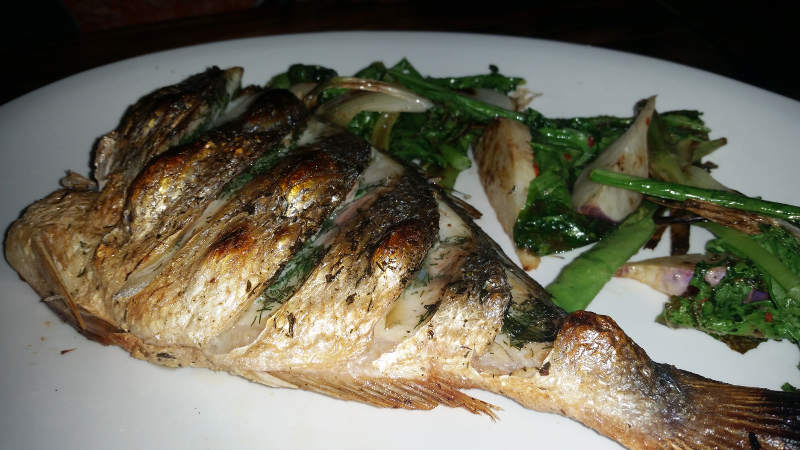 Whole Seabreem ($27) – served with braised lettuce, and roasted vegetables. This is a whole fish. Looks similar to a Red Sapper but a little meatier and not over powering. You can choose with or without head. The bones are included but are removed very easily. It was stuffed with some herbs, roasted and enjoyed by all. Both of these desserts were outstanding. 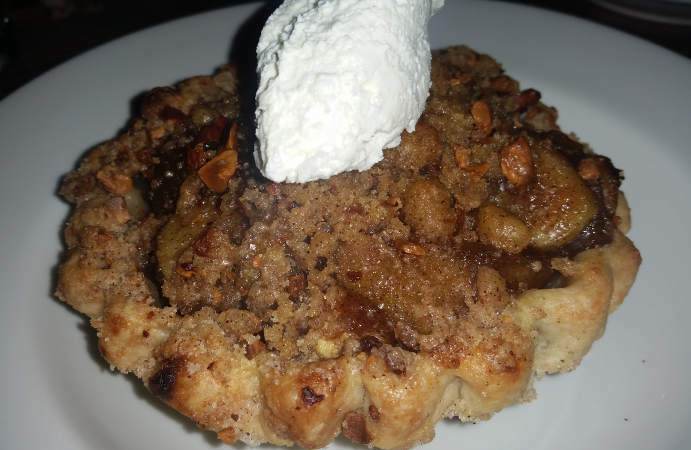 The pie was a large “personal” pie (not a slice) with a lot of flavor and perfect to share in a group.